This book compiles scriptural passages and sayings that would pertain specifically to members of Delta Sigma Theta Sorority, Inc. However, it should be clearly noted there is nothing in the work that would divulge information that only members of this fine organization should know. The passages and sayings can be inspiring for all people who seek uplifting words from Scripture and other words of wisdom that will help people live every challenging day of their lives. Gwendolyn D. Harris Persons was initiated into Delta Sigma Theta Sorority Inc. through Delta Upsilon Chapter on the campus of Western Michigan University on September 20, 1969. She activated with the Detroit Alumnae Chapter in 1983. Over the years her involvement with the graduate chapter has been extensive. She has held numerous committee chair positions and has served on several committees. Of which she is most proud was serving in the position of chapter chaplain during the 1997-99 administration. It was while serving in this position Ms. 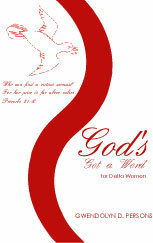 Persons began compiling God's Got A Word for Delta Women. Upon meeting Dr. Fairy C. Hayes-Scott, owner of Robbie Dean Press and, also, a member of Delta Sigma Theta Sorority, Inc., at the Detroit Black Writers Guild Conference in September 2000, Ms. Persons was encouraged to publish her work. Ms. Persons is a financial member of the Detroit Alumnae Chapter and has been a Golden Life Member since 1993.